You may bring a personal cooler, pillow, blanket and a small carry-on bag with you. While at the breakfast stop, we will allow you enough time to enjoy breasfast with time to change and freshen up. You should wear comfortable walking shoes and clothing for you day in New York City. Please take time to look over the map to plan your day. The bus will not be available for use during the day in New York City. We will make a couple of comfort stops en-route to NYC. We will make a pay on your own breakfast stop about 1 hour outside of NYC in New Jersey. 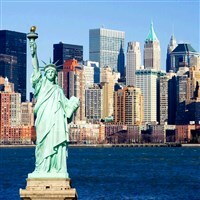 You will have time to freshen up and grab a bite to eat before you begin your adventure in the "Big Apple". 7:30-8:00 AM Approximate arrival in Manhatten. You will be dropped off at Bryant Park. The day is yours to do as you please. 9:30 PM The motorcoach will arrive back at Bryant Park to begin boarding for the return trip. 10:00 PM Prompt departure from NYC. We will make comfort stops en-route home. Cancellation Policy: 30 days prior to departure - Full refund less any non-refundable charges (i.e. theater tickets, service fees, etc.) unless notification of difference is noted on the tour description. Note: Please do not purchase non-refundable attraction or show tickets until the tour date is a guaranteed departure. Walking Code: 4 This tour requires a heavy amount of walking. To truly experience the program and destination, you need to be able to participate in physical activities such as long walking tours, walking over uneven terrain, climbing stairs and periods of standing. Some of the touring days may be longer, with select included activities occurring later in the evening.